Most high mountain animals are almost certainly fugitives, whether it be for a season or permanent residence, from the extreme competition for food, life and real estate in the crowded lowlands. For plants which are anchored in one spot for life, special design is needed for survival at high altitude. 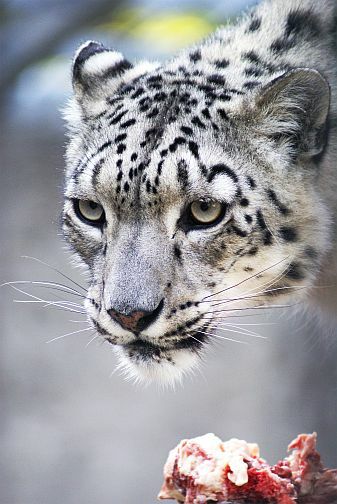 For mountain animals, however, which can move about from place to place, it is not as important. But size is. A very small mammal will lose heat so fast through its relatively large skin surface area, that it must stay extremely active and keep its little internal furnace continuously stoked, or it will freeze to death. For example, the mountain shrew, which is perhaps the smallest mammal at high altitudes, has an extremely high metabolism; its heart beats up to 1200 times a minute, it must eat something at least every hour and must consume its own weight in food every day, or it will die. Another little critter in the mountains, that doesn't stay still long enough for nothing, is the pika — I haven't gotten a decent photo of one yet, after many attempts! There are three main ways that warm blooded animals can deal with the extreme cold conditions on mountains: through hibernation, migration, or by seeking shelter under the ground or snow. Most large mountain animals migrate. For example, in the Rockies elk and bighorn sheep, which feed on the alpine tundra foliage during the summer, begin to head downward in late fall to avoid the deep snows. They spend the winter below timberline in thick protected areas. As the snows melt in spring they move upward again, following the newly sprouted tender shoots of willow. One of the greatest dangers the bighorn sheep face, however, are not predators such as mountain lion or even the harsh climate, but a tiny parasitic worm which invades its lungs. For a while the nature of this sickness was not understood because sheep in certain areas were completely free of it, while those in other spots were "ate up" with the ailment. Finally the trouble was traced to a small snail in whose body the worm must spend part of its life cycle before it can invade the sheep. These snails can only live in areas of limestone because they need the lime to build their shells. 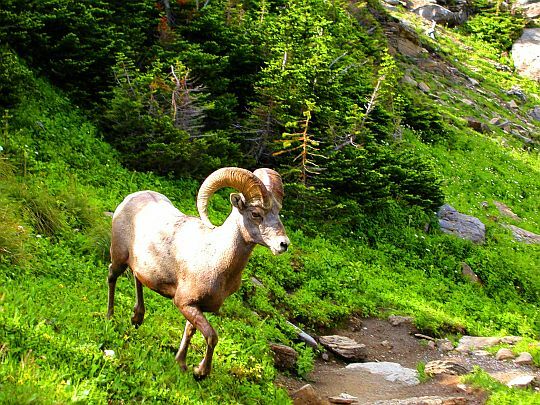 Thus bighorn sheep living in mountains made of granite are free of the disease, whereas those living in limey areas are vulnerable to infection. 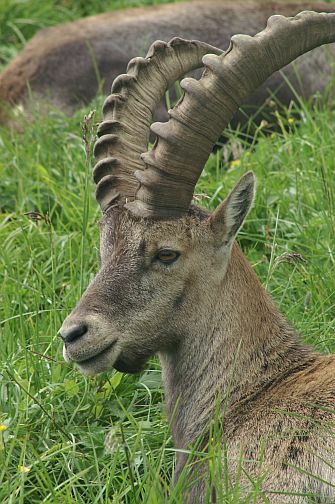 Large mountain animals, such as the Rocky Mountain goat, bighorn sheep, and the ibexes of the Alps are all very sure-footed. They each have specially designed hoofs which enable them to travel over really rough rocky terrain at great speeds, and also to traverse steep cliffs without losing their footing. These hoofs are flexible and also have relatively soft arched bottoms (kinda like your rock-climbing shoes) which give them excellent grip on steep, rocky surfaces. These animals also have to possess great agility, obviously, to jump and run over such rough ground, and they must develop it very quickly to avoid predators. Baby bighorn sheep, for example, can stand within an hour of birth. Within a week it can follow its mother wherever she goes, and within two weeks it can run as fast as she can! Many smaller mountain animals deal with the extreme cold of winter by hibernating. A ground squirrel, for example, finds an underground burrow, lines it with grasses and its own hair, and after gorging itself through the summer and autumn months (becoming a fat, round little butterball), will then retire to its cozy lair to sleep for months. This little den has a temperature around 45 to 50 degrees F. — balmy compared to the subzero weather above. The squirrel's bodily functions slow down and its temperature gradually drops to just above the ambient air temperature. The squirrel's normal heartbeat, of 200 beats per minute (BPM), will drop to only 20 BPM. In this metabolically reduced condition its energy stores will last through the long cold winter months, and it will wake up again when the warm spring sun shines, skinny and hungry but otherwise "bright eyed and bushy tailed." One mountain animal that doesn't follow any of the rules mentioned so far is the Rocky Mountain goat. It does not hibernate, migrate or live under snow banks (although it will dig into them to cool down in summer). Instead it spends its life mostly in the rocky, bleak lands above timberline. 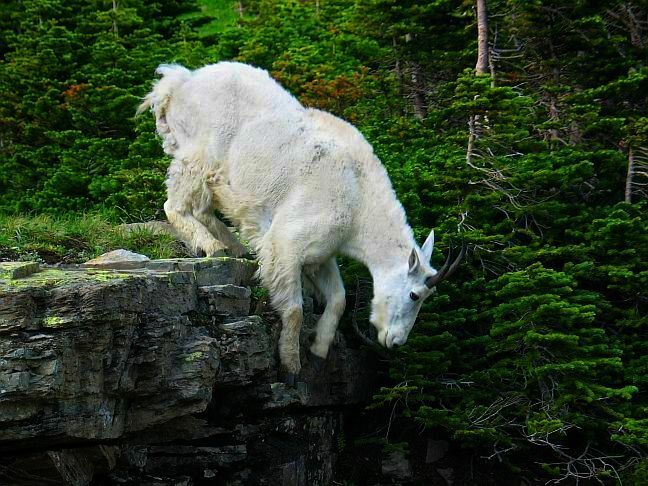 Mountain goats are among the most sure-footed of all mountain creatures. They are also very efficient in foraging for plants in areas with very "slim pickin's." These goats have four stomachs which allow them to extract the last bits of possible nourishment from their bleak rations. Cold is no problem for this animal; it has a nice woolly undercoat and long shaggy outercoat which works well as a wind breaker. My own personal experience with these animals, in the Cascades of Washington State, reflects their efficiency. These guys need salt in their diet and will get it any way they can. In some of the popular climbing areas they will literally follow you around, waiting for you to pee, and then come in behind you and lick it up for the salt content. I've had a mother goat with some babies follow me so closely I could have petted her, and no sooner than I had finished my "business" she was right there licking up the salt! For this reason, make sure you only pee on bare ground or rocks, because if you pee on foliage they will literally destroy the plant to get at the salt. One more amazing feat of survival among mountain animals in the extreme heights is that of a jumping spider in the high Himalayas. These little spiders can be found above 20,000 feet (6,096 m.), and live off glacier fleas and springtails, which in turn eat tiny bits of vegetation and pollen blown up the mountain from many miles away and thousands of feet lower. An amazing and strange food chain, for sure! Many of these insects spend the night frozen to the snow, waiting for the sun's heat to absorb into their dark-colored bodies and revive them again for another day of jumping and scavenging for food.